Al 6061-T6 Cold Drawn Seamless Tube 2.00" X .065" X 24"
Al 6061-T6 Cold Drawn Seamless Tube 2.00" X .065" X 36"
Al 6061-T6 Cold Drawn Seamless Tube 2.00" X .065" X 48"
Al 6061-T6 Cold Drawn Seamless Tube 2.00" X .065" X 60"
Al 6061-T6 Cold Drawn Seamless Tube 2.00" X .065" X 90"
Al 6061-T6 Cold Drawn Seamless Tube 2.00" X .058" X 12"
Al 6061-T6 Cold Drawn Seamless Tube 2.00" X .058" X 24"
Al 6061-T6 Cold Drawn Seamless Tube 2.00" X .058" X 36"
Al 6061-T6 Cold Drawn Seamless Tube 2.00" X .058" X 48"
E.R.W. Steel Round Tubing 2" X .120" X 60"
Titanium Tube 1.5" X .032 X 12"
Al 6061-T6 Cold Drawn Seamless Tube .250" X .065" X 90"
E.R.W. 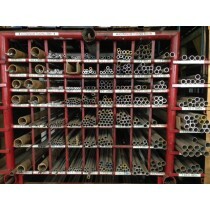 Steel Round Tubing 1 3/4" X .120" X 36"